The optical construction utilizes twelve lenses, including aspherical and AA elements, an ED (extra-low dispersion) element, as well as Carl Zeiss T* anti-reflective lens coatings. This all comes housed in a dust- and moisture-resistant metal lens barrel that weighs 778 grams and is 108mm in length. Other features include an eleven-bladed circular aperture for attractive bokeh; Sony’s SSM (supersonic wave motor) for quick and quiet autofocus; a large manual focus ring with AF/MF switch; internal focusing; and a physical aperture ring with a “de-click” switch for quiet operation during video capture. There’s no lens-based image stabilization system in the Zeiss FE 50mm f/1.4, but stabilized stills and video are still achievable when combined with Sony cameras such as the a7R II, which that features Sony’s camera-based 5-axis sensor-shift solution. An E-mount lens, the Zeiss FE 50mm f/1.4 remains compatible with Sony APS-C mirrorless cameras such as the A6500, where it offers an equivalent 75mm focal length (taking into account the “crop factor”), making it a good portrait and headshot option for smaller-chip Sony shooters. Tested on the 42Mp Sony a7R II, the Zeiss FE 50mm f/1.4 achieves an outstanding overall score of 45 points, thanks to its excellent low-light performance. Ranking in joint 5th place for all lenses we’ve tested on the a7R II, and joint top place for 50mm primes (alongside the cheaper $949 Carl Zeiss Loxia FE 50mm f/2), the Zeiss FE 50mm f/1.4 is one of the best-performing optics we’ve evaluated. Sharpness is extremely good, maximizing 41Mp of the Sony a7R II’s 42Mp resolution, with uniform edge-to-edge sharpness and high levels of acutance (over 70% between f/2 and f/11), and hitting peak sharpness between f/2.8 and f/8. Using the maximum f/1.4 aperture, strong acutance of around 70% is recorded in the center of the frame, with slightly softer results dropping to around 60% in the outer field. At the minimum f/16 aperture, diffraction reduces acutance marginally, down to around 65%, but resolution remains uniform. Rather heavy vignetting of –2.5EV occurs at the maximum f/1.4 aperture, and although the issue improves with narrower apertures, some corner shading around –0.6EV remains evident at all other settings. Chromatic aberrations are well-controlled at all apertures; there’s virtually no distortion as you’d expect from a prime at this focal length; and excellent light transmission of 1.6 TStop ensures a bright viewfinder image and plenty of light for the autofocus sensor. For our head-to-head analysis we’ve pitted the Zeiss FE 50mm f/1.4 against the cheaper $949 Carl Zeiss Loxia FE 50mm f/2 manual focus lens, as well as against the $498 Sony FE 50mm f/2.8 Macro, which features 1:1 macro magnification focusing and a focus range limiter switch. The Zeiss Loxia version achieves the same low-light overall score, with both 50mm lenses producing excellent results in challenging lighting environments. The Zeiss FE 50mm f/1.4 offers sharper results overall, however, and while the Loxia is still very good, providing excellent uniform resolution between f/5.6 and f/11 and very good center sharpness at the wider apertures, the Zeiss FE 50mm f/1.4 is stronger in the corners between f/2 and f/4. The Loxia distorts a little more at 0.4% as well, requiring a little correction for perfectly straight lines; and although both Zeiss 50mm options vignette quite heavily at their respective maximum apertures, the Loxia improves more quickly using narrower apertures, virtually eliminating corner shading between f/4 and f/22. 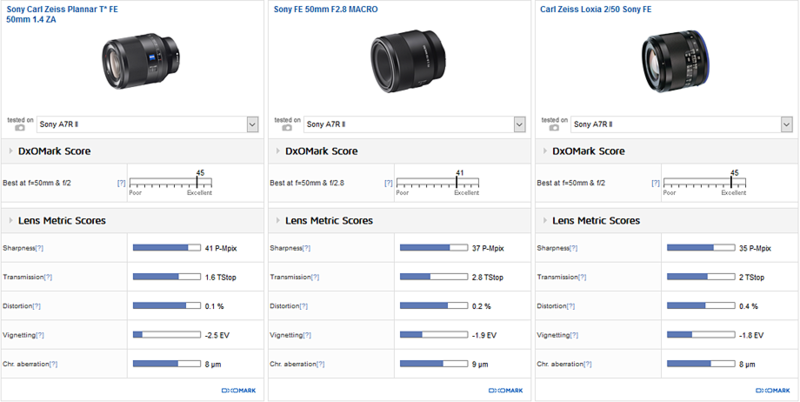 For the more budget-conscious Sony shooter, the Sony FE 50mm f/2.8 Macro compares very favorably with the more expensive Zeiss competition, again with excellent low-light performance resulting in a very respectable overall score of 41 points. Field acutance is very good on the Sony 50mm, too, with high levels of uniform resolution at all apertures and peak sharpness approaching 80% acutance between f/4 and f/8. With a two-stop slower maximum aperture compared to the Zeiss FE 50mm f/1.4, it’s obviously not as bright a lens as the Zeiss, but the cheaper Sony controls distortion and chromatic aberration well. Corner shading remains something of an issue on the Sony 50mm as well, however, with heavy vignetting around –2 EV at f/2.8; and although it’s reduced to around –0.6 EV using the smaller apertures, you’ll need some correction for completely clean results at all settings. Adding a very fast f/1.4 maximum aperture option to the Sony/Zeiss 50mm lineup will be welcomed by Sony a7 shooters looking for a high-performance, general-use, low-light lens. Costing $1498, it’s a pretty expensive option, and at 108mm in length and weighing 778g, it’s a fairly bulky bit of glass for use on the smaller Sony mirrorless cameras, too. If you’re after the best results from your a7 series hybrid at 50mm, however, the Zeiss FE 50mm f/1.4 is outstanding, delivering some of the best low-light performance and sharpness possible in this category. The large manual focus ring, MF/AF switch and physical aperture ring with ‘de-click’ option make it versatile for videographers, and for stills shooters its bright light transmission and SSW motor should facilitate excellent autofocus performance even in low light. Photographers, specifically videographers, who can live with a one-stop slower maximum aperture and manual focus, can expect similar low-light performance and still excellent resolution from the cheaper $949 Carl Zeiss Loxia FE 50mm f/2 — a lens roughly half the weight and length as the Zeiss FE 50mm f/1.4. For around a third of the cost of the Zeiss, the Sony FE 50mm f/2.8 Macro also delivers very good results, with excellent sharpness in its available aperture range. 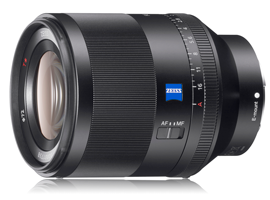 But if it’s outstanding low-light performance, first-class sharpness at very wide apertures, and snappy autofocus that you desire in an FE-mount 50mm lens, the Zeiss FE 50mm f/1.4 is unrivaled and an excellent choice for the discerning Sony a7 series owner. For greater insight into the performance of alternatives to the Zeiss FE 50mm f/1.4, please see our A7R II best prime lens review, as well as our in-depth Sony FE 50mm f/2.8 Macro, Loxia FE 50mm f/2 and Sony FE 50mm f/1.8 lens reviews.